MECHANICAL FILTER is typically describe a fibrous material commonly called a throwaway or replacement type which comes as standard equipment on forced air heating and cooling units. 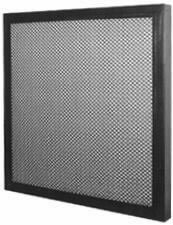 PERMANENT OR WASHABLE FILTER consists of a metal frame with a viscous impingement type of filter material supported by metal baffles with air passages. These filters may be removed, cleaned with detergent, and dried. 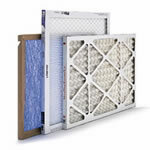 ELECTROSTATIC AIR FILTERS is highly recommended to install in your heating and cooling systems. These filters use the precipitation principle to collect airborne particles, these can be: Ionizing plate, charged media non-ionizing and charged media ionizing. ULTRAVIOLET LIGHTS (UV) is used to sterilize the air in duct systems. UV lights will kill mold, fungus, bacteria, and any other living organisms if the light is intense enough for the airflow. These lights have been popular in hospitals and now are available for residential and light commercial. These UV are located in the plenum where they sterilize the air before it enters the room. Complete selection from that manufacturer.